A large four-sided die with no numbers; approximately 1" across. Only available in white. A large six-sided die with no numbers; approximately 1" across. Only available in white. A large eight-sided die with no numbers. Approximately 1" across. Only available in white. A large twelve-sided die with no numbers. (A dodecahedron with rounded edges; approximately 1-1/8" across). Only available in white. A large twenty-sided die with no numbers; approximately 1.3" across. Only available in white. Unique four-side die with blank faces colored red, yellow, blue, and green. Approximate diameter 0.8". Six-sided die with a large color spot on each face: red, green, yellow, orange, magenta, and blue. 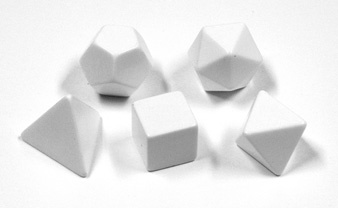 Set of five standard blank dice: d4, d6, d8, d12, and d20, the five Platonic Solids. Approximate diameter 5/8". Only available in white. 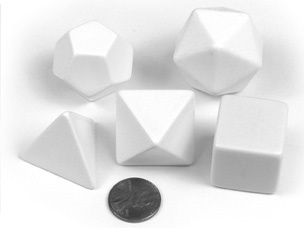 Set of five jumbo blank dice: d4, d6, d8, d12, and d20, the five Platonic Solids. Approximate diameter 1". Only available in white.